For the first ever time in Thessaloniki, a trip into the wonderful “cinematic pop”world of KID MOXIE. Electro pop /new wave band GLASS REBEL will be opening the show. 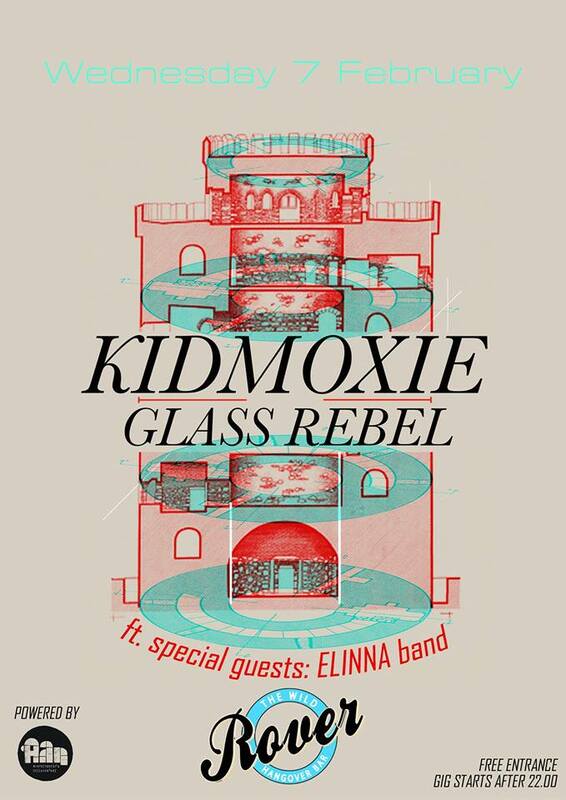 Kid Moxie is the musical moniker of Greek born Elena Charbila, bass playing singer and actress based in Los Angeles. She cut her teeth on Athenian indie electronic scene in 2007 with her debut Human Stereo but it wasn’t until 2009’s Selector LP that reached early international fame as a signee of Undo Records. At the same time, her acting was in demand and by the end of 00’s Kid Moxie had already start getting gigs in film studios in Los Angeles. Yes, it is her on Bereave (starring Malcom McDowell and Keith Carradine), Wilde Salome (directed by and starring by Al Pacino) as well as several international TV ads for the likes of Apple iPhone or McDonalds. Being immersed in both those worlds since she was a kid, it was kind of inevitable that she would want to merge acting and music somehow. It was around 2013 when Kid Moxie decided to get back into music and start shaping what have now become her signature sound. A blend of noir pop melodies, haunting soundscapes and powerful beats defined the sound of “1888” including collaborators such as The Gaslamp Killer and Twin Peaks legendary composer Angelo Badalamenti. Right after, Badalamenti picked Elena to work on a new version of ‘Mysteries Of Love’, from his soundtrack to Blue Velvet, originally recorded with David Lynch and Julee Cruise. With most of the tracks and music videos from “1888” scoring premieres in Entertainment Weekly, Vogue, Stereogum, and Noisey, a heavy remix package including Clint Mansell Requiem For A Dream, The Fountain, Black Swan) and Maps (Mute Records) versions secured album’s reputation. Instead of a follow up tour, Kid Moxie kept herself even more busy with acting . In 2016 a new collection of tracks came together and it was about time to record her fourth album. “Perfect Shadow” released on West One Music Group with The Gaslamp Killer on production credits and Astronautica (of Alpha Pup Records fame) to provide remixed work. There was more connection to John Carpenter's melodies in there than any other work of Kid Moxie and it was the album that added a cinematic edge to her sound. Publicity and raving reviews kept coming with Noisey and Nylon to getting there first. Earlier this year while Elena was just adding some coolness to her live presence by performing alongside cool disco dude Luxxury, phone rang again and she went back to Greece. In a place she now calls home, she is getting ready to combine acting and music in a common effort for the first time ever. Currently, she is finishing soundtrack composition for the movie “Unpleasant" , a Faliro House co-production where she also holds one of the main roles. While in town, she even found time to add more cool collaborations to her bio, as a featuring vocalist for the likes of local pop star Monsieur Minimal on his Greek lyric single Ici or the post electronic don 2 By Bukowski who also goes by the name Achileas Charbilas and is Elena’s cousin. Future could only look bright for a kid who turned two of her leisure time activities in daily routines and now divides her time between acting (from indie Greek films to US national TV commercials for SONY PLAYSTATION, ABSOLUTE VODKA, CHRYSLER or voiceovers for popular video games such as Diablo) and music producing and performing. Please note that Elena Charbila isalso involved with the David Lynch Foundation, where some of her music is currently featured. This is a non-profit label featuring exclusive tracks by leading artists like Moby, Tom Waits, Iggy Pop and Maroon 5 among others. All proceeds from song sales go to raising funds for several non-profit projects initiated by the David Lynch Foundation. Glass Rebel is a new Εlectro/Νew Wave project from Athens, Greece. The band was formed in the Summer of 2016 when their debut digital electro/pop single “Trees”was released sharing vocals with the female electro duet of Marsheaux. The radio-friendly track was recognized by many european blogs and was attracted to the airplays of several radio stations. In April of 2017 the Synth/New Wave Sci-Fi theme ”Suntan” is released digitally and the first 7” Vinyl “Trees/Suntan” is out by Amour/EMI Records, distributed in Europe by Audioglobe. In May of 2017 the second double A-Side 7'' Vinyl is expected to be released, featuring two brand new special guest-artists. The band just finished the studio recordings of its 3rd release that will be out in September, however, remains in the studio, working on new material and getting prepared for its upcoming shows. All proceeds of the band’s digital sales are to be donated to the ‘Society for the Care of Minors’. Elinna is a 22 year old singer/songwriter that is influenced by rock, blues, indie and alternative music. She has been the vocalist of several bands in her hometown, participating in music festivals and performing at acoustic gigs. Elinna and her band have performed in various venues of Thessaloniki both as opening and main acts such as ΚΟΘ Underground and Pic Nic Urban festival. The band’s musical influences mainly derive from indie rock, blues and alternative genres .With the addition of the new members, Giannis Petrovitsos ( electric guitar), Christos Solakis ( bass) and Giorgos Tsiolchas ( drums), the band has acquired a more dynamic, alternative sound combined with indie rock elements. Elinna first started working on her debut album in 2016. Her single 'In your sleep' was released on 28/10/16 and the full album ‘Give me a Sign’ in 2017.